The arbitration panel has awarded its ruling on the USADA versus Floyd Landis case. In its 2 to 1 decision in favor of the USADA, my mental cogs are still churning and the spurious rationale of the majority decision is emerging. In the determination of the T/E ratio by the Gas Chromatography (GC), the panel found that the Lab failed to follow the procedure outlined by WADA TD2003IDCR. Therefore no adverse analytical finding could be rendered. Whoo hoo! That charged was dismissed. It is on the second test the CIR or the GC/C/IRMS that is of issue. WADA TD2003IDCR states the difference in retention times will be 1% or plus/minus .02 minutes whichever is smaller. The majority decision states the retention times of the two machines are different 25 minutes and 45 minutes. OK. Two machines -- absolute retention times won't be used. Clear enough. A logical conclusion is that the relative retention times of 1% should be applied. Dr. Wolfram Meier-Augenstein calculated the difference in the LNDD relative retention times at 7%. Um, 7% is outside of the 1% range in this universe. Clearly an exception to the International Standard of Laboratories or an ISL has occurred. But the majority says oh no, the TD2003IDCR does not apply since there are two machines involved. What the? TD2003IDCR is a mere five page document. No where in the document does it say it applies to only one machine. No where in the document does it say if there are two machines then eyeballing it is ok. So either the relative retention times applies to what the LNDD does with its equipment, or the entire process of using the two machines is out of spec or "not fit for purpose" and is an exception to the ISL standard. Clear to me. This decision is not based on science or process, merely politics. I stood there. I stood there savoring the moment. My heart was still beating fervently pumping blood and oxygen not yet aware that I was now standing by my bike looking over the ridge. Feel good in my King of the Mountain moment after pedaling my way up the road. The view to the south down the valley opened up into suburbia and civilization. The view to the north was the next line of mountains to conquer. It was a good stopping point - an hour and two minutes into my ride. It was a good turn around point as well. Enjoy the moment. The air was bluer here and my heart rate was slowing rapidly. The accomplishment needed to be applauded and a strange realization of my motivations reflected upon. I squeezed water from the bottle on my head first. The cool rivulets flowing down my face and back were a welcoming sensation. The heat in my cheeks subsided. I gulped down the rest of the water. Motivation. Inspiration. Heroes. Sometimes it’s winning the race that motivates others to get out ride. Sometimes it’s an arbitration battle. For me it is the David and Goliath struggle between big bureaucracy and individual rights between the US Anti Doping Agency and Floyd Landis. It is the fallen champion battling to take back what is rightfully his, in a crusade to educate the public on science, civics and cycling that has inspired me to write senators and representatives. Something I haven’t done since fifth grade. Floyd you have motivated me to purchase a bike and hit the road, visit Colorado and watch a mountain bike race. The cycling industry owes you big time, and I am just getting started. In spite of the AAA ruling you are still my hero. The USADA case was just the dress rehearsal and I am ready to be “gullible” again and support the next round. In an instant my thoughts were back to the reality of the descent and curving fluctuations of pavement. It was a good ride. I hope you have many more good rides. While I have been waiting for the ruling in USADA versus Floyd Landis case, checking out the smoke on Peloton Jim's, and reading the daily musings of bloggers about the lengthy passage of time on Trust But Verify, I did my own digging into the facts of USADA verdicts. Having waded and traversed the rulings on the USADA web site, I have gleaned information on the opening day of past hearings to their arbitration awards. 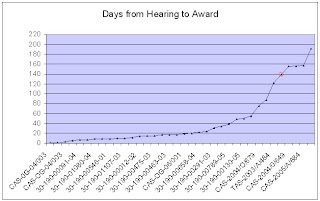 I was able to identify 39 cases where I could determine both start date of the hearing and signature or fax date of the award. Remember, no athlete has won against USADA. Although, I thought one athlete Genevieve Jeanson came pretty close to a reprieve in 2004 as she received a warning instead of a suspension for a missed test. Sadly though Ms. Jeanson was sanctioned in 2006. Tyler Hamilton 157 days and Tim Montgomery 191 days. In the mean time, check out the arbitrators' websites Patrice Brunet, Richard H. Mc Laren, and Christopher L. Campbell as we all wait patiently for this chapter to come to a close.